Why did I not think of doing a Studio Ghibli countdown before? Seriously, I love their movies! 🙂 Hayao Miyazaki and his people have done fantastic, influential work, thoroughly earning their international success as they have weaved one enchanting story after another. First up, coming in at the rear of the pack, is Ghibli’s version of The Little Mermaid. 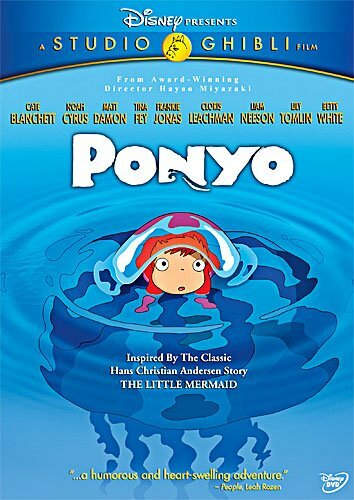 The reason Ponyo gets put at the bottom of this particular list is because there were a few things they didn’t really explain, like how Ponyo liking a human and taking human form and such somehow corresponds with a desperate crisis all across the seas. Very unusual, that. Also, and even more to the point: these kids are, what, five, six years old? Pairing them off that early, and with planetary crises threatening to happen if they ever cease to be a couple, felt just a bit creepy to me, and forced. 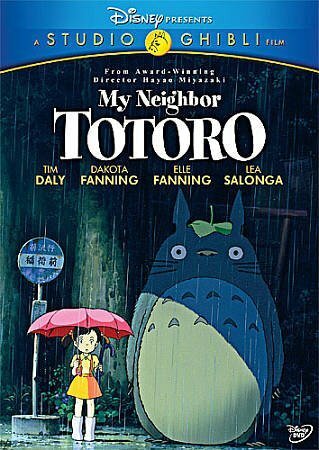 I think what I love most about My Neighbor Totoro is how it feels so much like the imaginings of a pair of children. After all, when two young sisters suddenly find themselves in an old, empty (until their arrival) house, in the middle of the country, what else are they going to do but make up adventures and imaginary friend? The enchantment of this movie is the most simple and potent of all: that of childhood. Still, this movie did lose me a bit we it went on. It felt longer than it was, and while it was fun, not much seemed to actually happen. I never really got a sense of tension. And I want to emphasize, here, that there is no need for danger in order to create tension. I’m not out to have these little girls placed in danger. 😉 It just didn’t feel very exciting. Oh, it was a nice movie, very nice! Pretty fun, heartwarming, and amusing too. Just not very riveting, per se. Like Totoro, that doesn’t make for much in the way of excitement, but it’s still entertaining. The tension isn’t really about the “now” so much as it is about the future. The main character is learning to look up from her books, see beyond the fantasy world of her childhood, and she’s coming to respect the weight that will fall on her shoulders as she gets older. It’s a bit daunting, in fact, and she has to change how she does things if she wants to succeed. She’s been driven forward the way most kids her age have, by outside forces, but now she’s learning to drive herself forward. She’s learning that pursuing dreams takes hard work, so she starts working hard. It’s that simple, really. Part of this is her developing relationship with the boy who becomes her first boyfriend (possibly even her future husband, if they so choose). It’s this cute, amusing back-and-forth at first, with some surprising, tender moments mixed in as they grow fond of each other. His example, already knowing what he wants to be and working hard to achieve it, help push her to do the same. And it turns out that he’s had a crush on her for ages, but never plucked up the nerve to talk to her. No, instead he came up with this convoluted scheme to try and get her to notice him! Ah, teenagers! LOL! 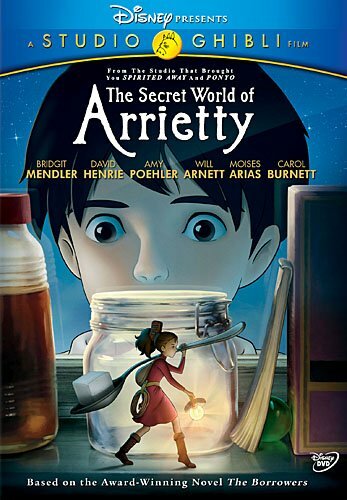 Which I originally knew, here in America as “The Secret World of Arrietty.” Exactly why they decided to change it for the English release, I do not know. But whatever. Arrietty is about the unusual, unexpected friendship which forms between a human boy and his little Borrower friend. It’s a relationship which both protects and endangers Arietty’s family. Being so small, and so remarkable in the eyes of normal humans, Borrowers are right to fear and avoid attention like the plague. Even in the best case, a fascinated, well-meaning human can endanger them with their “help.” They’ve got enough to deal with just surviving rodents as big or bigger than themselves and all sorts of birds, they really don’t need to deal with humans’ fixation on them. Thing is, like Ponyo, Totoro, and Whisper, Arietty is one of those where not much actually happens. There’s tension, of course, in evading unwanted attention while also surviving the dangers which threaten them (very important to do both of those at the same time! ), but it was fairly low key. As such, these four films, great as they may be, are the lower level of my personal countdown. 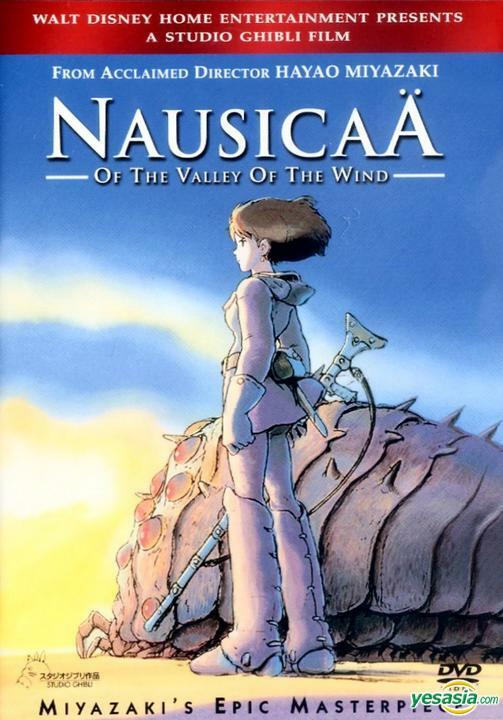 Nausicaa is the princess of a very small, humble kingdom in a valley. Her world (our world) was once burned, almost completely destroyed, by giant artificial creatures, machines of destruction. Even a thousand years later, the land is still filled with their leftover poison. However, the Toxic Jungle, as it’s called, is slowly purifying the soil and water, gradually restoring the Earth while under the protection of enormous insect-like creatures called Ohm, which, as it turns out, have a certain ability to heal and sort of communicate with humans. All of this makes me suspect that someone genetically engineered both the jungle and its protectors, to repair the massive damage done to the world. Now, while the damage was unquestionably done by the work of humans, or what they created, the effort to repair it is not decidedly shown as also being human born. It’s reasonable, I think, but never stated. So, it looks as though they’re portraying the dominant portion of humanity as being destructive towards the Earth, which leaves something of a foul taste in my mouth. However, it was Japan who had The Bomb dropped on them, which would leave a powerful racial memory on any people. Also, they’ve been particularly unkind to their environment, so it makes all the more sense for a Japanese man to craft a story about a post-apocalyptic world where nature has been devastated by human hands. It’s a trope I’m sure I’ve seen elsewhere, though I fail to remember an example at the moment. In this beautiful/intimidating world, there is a fantastic depiction of humanity, good and bad alike. There are nations which do terrible, monstrous things in the name of protecting themselves from each other, and there are people in each which want nothing to do with such. There are people who think they need to break and burn things, ignorant of how this will lead to their own destruction, and heedless of wiser, calmer, more humble voices. There are people who think, “There is no coexisting with the enemy,” and that holds true for even the most reputable of peoples, and then there are those precious few who believe coexistence is the only path towards long-term survival. To that end, they pursue the knowledge that others ignore. In short: it’s a fascinating, and gripping, depiction of humanity’s struggle to live and prosper. 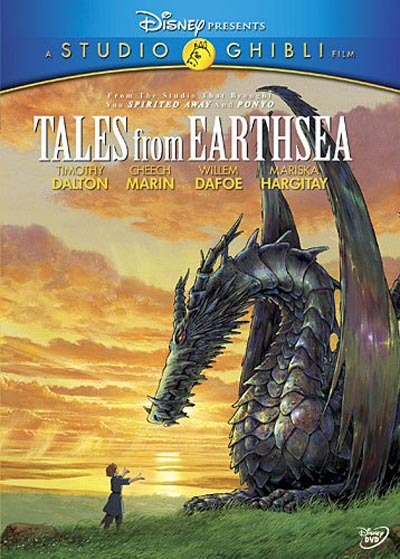 I actually read most the Earthsea books, by Ursula K. Le Guin, which this movie was based on. In fact, I made it all the way to the last book, Tehanu, but never finished it. I was mostly just trying to complete the series for the sake of completing it at that point. I had found most of it to be fairly boring and uneventful. So, with this fairly unique perspective of mine, I was wondering how Ghibli would approach this. Another fairly simple story, really, about a girl gaining the confidence and nerve to stand up for herself. 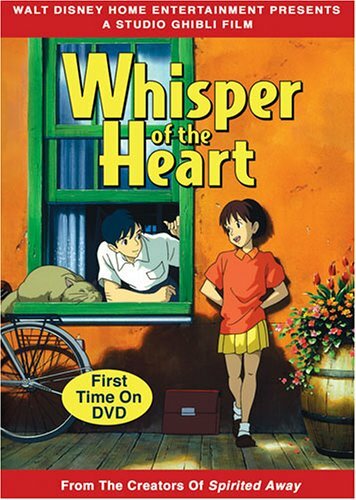 There are two or three characters in this movie that technically have their origin in Whisper of the Heart, which featured, in smaller roles, a fat, white cat and a cat-man figurine called “the Baron.” Outside that, there’s no real connection between the two movies, so it’s a bit misleading to call Cat Returns a sequel to Whisper. 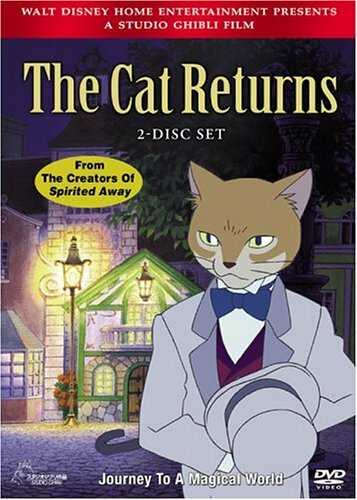 Cat Returns is generally more in line with movies like Whisper and Arietty, as things happen, but not that much. I just found it too charming to put below Nausicaa and Earthsea. 😉 Now, however, we’re about to take another little step up! Now we’re getting into the real meat of the Ghibli library! Here’s where things really become a tightly-packed competition! 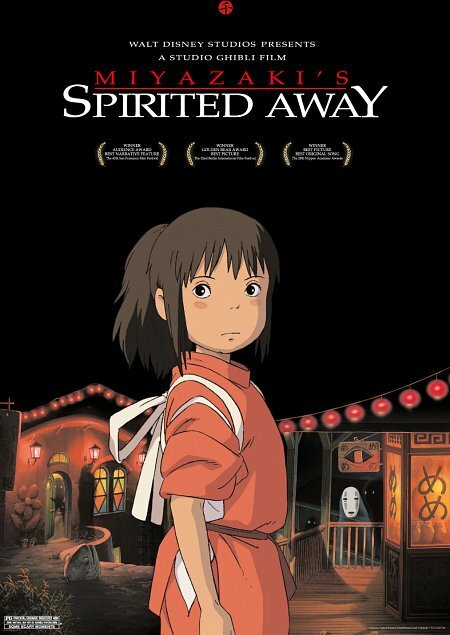 There’s so much I love about Spirited Away! We have Chihiro, a regular little girl, trapped in a most unusual and dire circumstance. She’s never had to handle anything difficult or dangerous before, but she rises to the challenge! At first, she’s timid and afraid, but between her wits and her will (which, she becomes pretty brave by the end), she overcomes obstacles and wins the affection and respect of those around her. She helps herself by helping others and being helped in return. The problem with this movie lies mostly at the end of it. After being plunged into the spirit world, threatened by Yubaba, fighting to save her parents, cleansing the river spirit, facing down the witch Zeniba, saving Haku’s life, and restoring No-Face back to his original state, the last portion of the movie felt a bit anticlimactic. The train ride was dull. Zeniba turned out to be a more pleasant person than she seemed (so why was she being so nasty, and why is Yubaba afraid of her?). Haku was restored in an instant. And Chihiro had no difficulty passing the final test whatsoever. I’ll admit it was amusing, but the tension was pretty much gone after the No-Face debacle, ya know? I love how most of these stories can be summarized into something pretty simple. Growing up, learning confidence, children having adventures, being brave as you move to a new town… it’s just really neat, ya know? 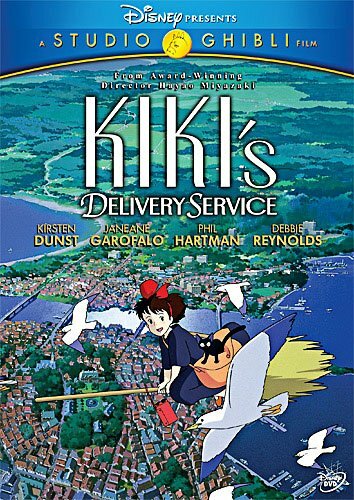 Kiki’s Delivery Service is about its titular character, a young witch who’s gone to live away from home for year as a rite of passage. For all that she can do magic, and fly (ooooooh! My soul doth droooooool with envy! ), she’s still just a teenaged girl, not sure what she wants, not sure what she can do. She seems so normal, while others are so remarkable in some fashion, like the witches who tell fortunes or brew potions. Kiki’s best talent seems to be flying, and what’s so special about that? Still, she’s clever, and her delivery service seems to do well enough for her to pay the rent. She’s still not at all sure of herself, though (and overcompensates for this when she’s talking to a cute boy by acting all high-class on him, LOL). In time, she even finds that the one thing she can do, she suddenly can’t. Her magic’s gone, and she doesn’t know how or why. She gets some good advice, then, about inspiration and finding her center, which sometimes involves taking a break from everything. When a crisis hits, however, and a good friend is in danger… well, no time to wait, she digs deep and seizes what she needs right then. In short: Kiki’s story is that of a girl learning about herself and what she can do. 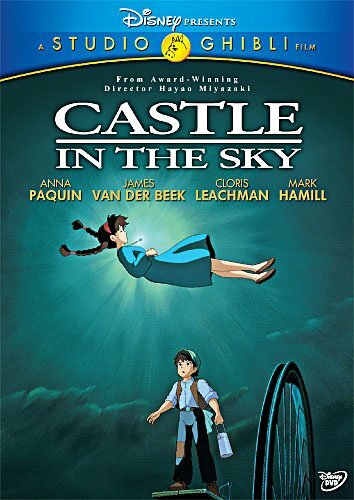 Ghibli’s version of the story is pretty good, though. It has allusions to and incorporates elements of the original, but it’s definitely its own work, completely different. …and when she gets cursed by the Witch of the Wastes because she happened to be a girl who had any sort of contact with the wizard Howl in any way, shape, or form, she becomes an old woman. Following this, she leaves town, heads into the Wastes, and becomes Howl’s cleaning lady. A few adventures and misadventures later, she and Howl save each other, body and soul, and fall in love at the end. Between the characters (Calcifer the fire demon being my favorite), the magic, the depiction of a nation that’s plunged into a foolish war starting off so confident and then knowing the panic of ruin coming down on them… well, it’s a gripping, entertaining, amusing tale! I didn’t much like the younger voice of Sophie in the English dub, but I appreciated her journey, tenacity, and resourcefulness, not to mention her selflessness. I also love how her growth enabled Howl’s. If there’s one thing that will compel a man to stop running around like a fool and stand his ground in battle, it’s knowing that the people he wants to protect – the woman he loves, for instance – are right behind him, and he is their last line of defense. 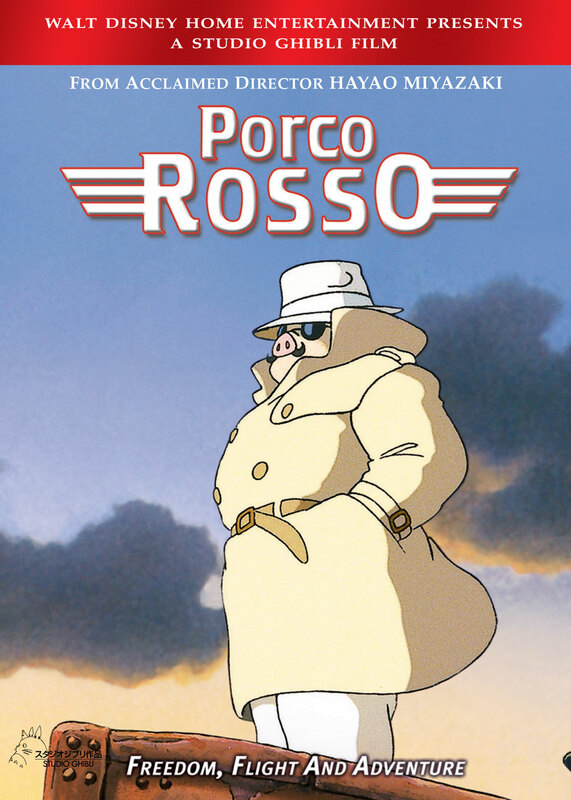 One thing I very much like: Porco is proof that you don’t have to be good looking to be popular with the ladies (which is fortunate for most guys! ), you just have to be a capable, confident man who knows how to treat them right. Which, by the way, involves treating them like a person instead of a prize, which Porco’s adversary, Curtis, really needs to learn. A number of these movies involve their main characters undergoing a critical piece of character growth, of maturing and becoming stronger, more capable. Porco’s story, by contrast, is far less about his capabilities, much more about his heart, the emotional weight he carries around with him. He wears it well, like that trench coat he’s always sporting, protecting himself. But he’s closed himself off with it, his survivor’s guilt, and it’s keeping him from some happiness. Through the events of the film, the influence of his friends and adversaries, I think Porco is finally able to let it go. Whether he found his happiness after that… well, that’s up to him. 😉 But he’s finally reached that place where he can, that’s the point. Speaking of those friends and adversaries, I gotta give a shout out to the people who create these fantastic characters, most of whom you never know the names of, yet fall in love with. That goes for the hilarious space pirates, for the many Italian women who rebuild Porco’s plane, for his friend who offers a fantastic prayer of thanksgiving, and all the rest, who absolutely shine in support of the most prominent cast members, being a fine lady, a headstrong mechanic girl, and the two gentlemen of different flavors, Porco and Curtis. There is exactly one small detail which always annoys me: clouds… are not… like the ocean. Clouds are vapor. They do not splash and make noise when cannon shells are propelled through them at speed. That’s a detail Ghibli get wrong, both here and much more so in Nausicaa. Seriously, you would think that after all the times I’ve talked about how I hate stories with incredibly high body counts, I’d be a bit more averse to this movie. But I’m not, for some reason. I love it. I absolutely love Princess Mononoke. It talks about man’s relationship to nature, and with his fellow man as well, but without any clear solution offered, which limits how anti-human the movie can be. In fact, in following the dispute, and Ashitaka’s quest “To see with eyes unclouded by hate,” it becomes more about finding peace and balance, and forgiveness, between two sides that have long spilled each others’ blood. It’s about ending a feud, and what happens when you refuse to do so peacefully. Basically… take all the strengths Ghibli has shown throughout these films, and refine their weaknesses into something stronger. 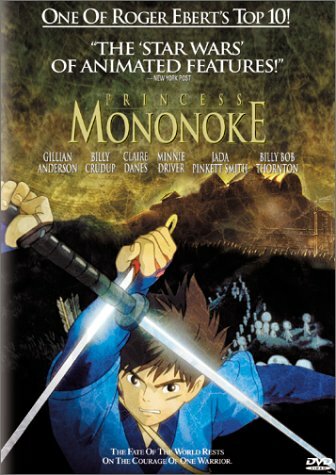 That’s what they did with Princess Mononoke. That’s why I consider this to be, above all the rest, their crowning masterpiece. 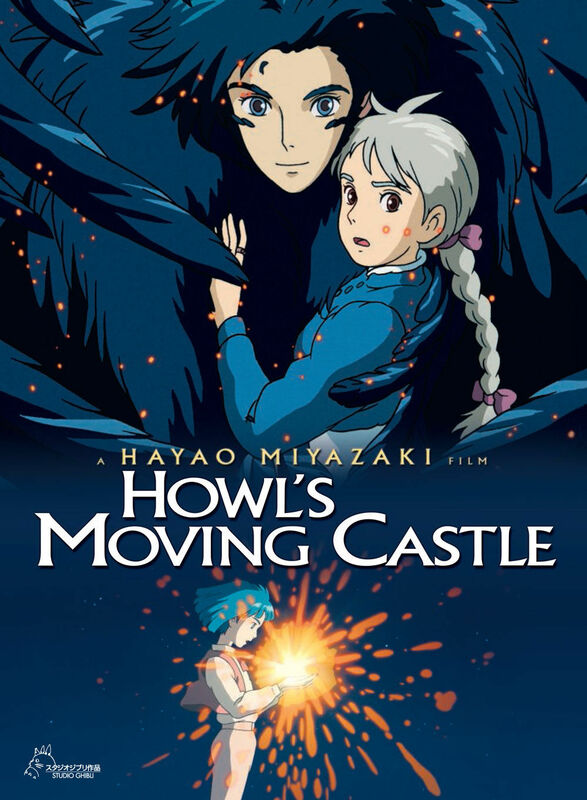 This entry was posted in Anime and Cartoons, Countdowns, Movies and tagged Castle in the Sky, Howl's Moving Castle, Kiki's Delivery Service, My Neighbor Totoro, Nausicaa of the Valley of the Wind, Ponyo, Porco Rosso, Princess Mononoke, Secret World of Arietty, Spirited Away, Studio Ghibli, Tales from Earthsea, The Cat Returns, Whisper of the Heart. Bookmark the permalink. Hey there. Just wondering, could you check out my trailer analysis and tell me what you think?